When you live and work in North Dakota, you don’t fear the bitter cold – you embrace it. Minnkota’s fearless transmission team decided a frigid day was a perfect opportunity to put the all-electric Bolt to the winter test, so they hopped in early Wednesday morning for a trip down to Fargo, N.D. The four men had an all-day transmission planning meeting at Cass County Electric Cooperative (CCEC). 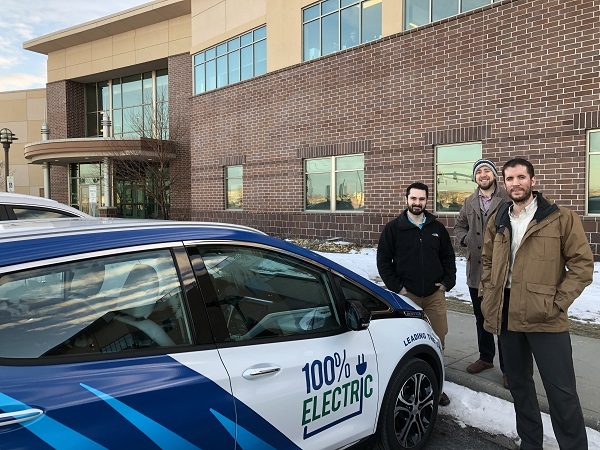 Minnkota engineer Will Lovelace saw a chance to get comfortable with the electric vehicle’s capabilities (and challenges), and his power delivery colleagues – Brendan, Tim and Logan – were willing to come along for the ride. The crew took off from the Minnkota fleet garage early in the morning, when the air temperature was 3 below zero. 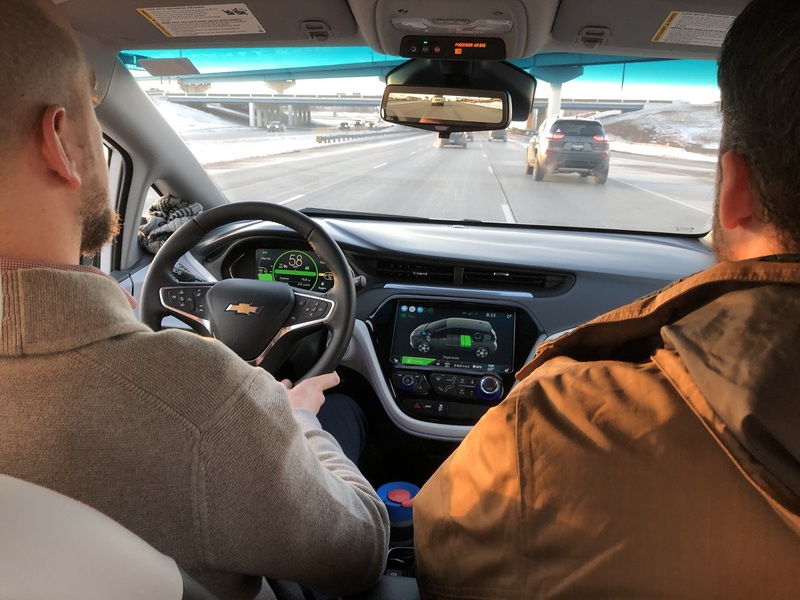 The expected range on their departure was 168 miles for a 77-mile one-way trip, but Will knew that the temperature and speed of interstate driving would zap a lot of that energy. As Lovelace (left) and his team rolled into Fargo, they made a note of just how much battery power had been used on the way. It was more than they expected. Thankfully, CCEC has its own Level 2 EV charger in its garage, so they plugged in the Bolt for the next 6.5 hours. When they returned from their meeting, the car was completely charged with an additional 43 kWh of power and ready for the 77 miles back home. “I think we would have had more anxiety if the meeting wouldn’t have been as long,” Lovelace joked. The return trip was a little warmer at a “balmy” 8 degrees, and the Bolt's occupants took some time to check out the car’s energy settings and displays. Lovelace revealed that he did have a tough time peeling his eyes away from the miles remaining as he drove the car, a common symptom of the “range anxiety” experienced by new EV drivers. But when asked if he would take the EV to another meeting or event in the future, he didn’t hesitate. Note: After this trip, the Bolt’s fully-charged battery anticipated a 130-mile range – much lower than the touted 238-mile range. This is because the Bolt calculates the expected range based on the driving situation of the previous trip (cold, fast speed, heater running, etc.) The difference confirms that cold can reduce range up to nearly 50 percent, so careful planning for longer trips is key. We plan to take the Bolt out for many more experiences during our cold winter months, so stay tuned for more data!